The above listed members are headquarters staff members. Because of the large numbers of PSDA Water Rescue Instructors in the field we do not post a list on line. Individuals Dive & Rescue Team or Departments may contact PSDA & Water Rescue Headquarters for a referral to a PSDA and Water Rescue Instructor in your area. 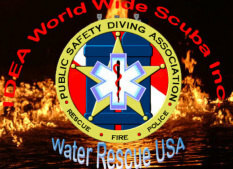 PSDA & Water Rescue ©1996 Water Rescue USA©1996 IDEA©1971 are divisions of IDEA World Wide Scuba Inc.©2015 all rights reserved.